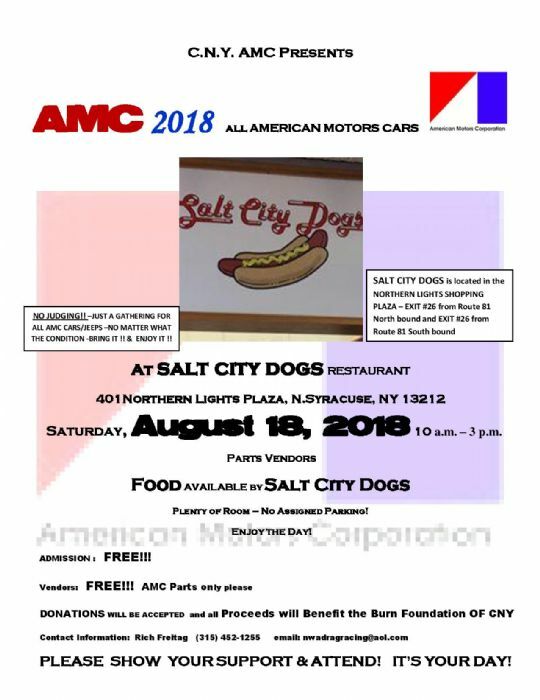 CNY AMC car club will have our show & swap meet on August 18th 2018 at Salt City Dogs 401 Northern Lights Plaza North Syracuse NY 13212 From 10 am -2 pm.Phone # 315-452-1255 The Show flyer is on Facebook under CNY AMC car club !! About how many AMCs have been on displayed in previous shows? Attached is the flyer for the 2018 CNY AMC show ! Hope to see ya there!! I don't know how to say this, but must. IMHO any AMC show is terrific, however, about how many AMC cars have attended this show in the past? I need to ask because this year there are no AMC shows in the northeast, I'd really like to see anything AMC, but I would be driving 6 hours from central New Jersey, will need to stay overnight. I just can't make the trip if only five cars are going to turn up. It's only from 10 to 2. I will be there with my BBO 70!! Im originally from Griggstown NJ, and its a nice ride up here in case you haven't done it before and a very nice area. I'll be here with a 1979 AMX bought from Siccora Motors AMC dealership. Hope you can make out. Wow, that's a small world. I'm in North Brunswick, not far from Griggstown. I bought my 1972 Javelin AMX from South River AMC, but if I needed any tune-up parts I bought them from Siccora Motors AMC. Still have NOS unused AMX chrome exhaust tips I bought there.